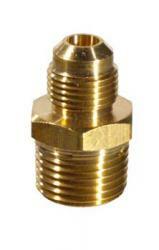 Burner has a 10 psi regulator, a brass control valve and 50 inches of Stainless Steel Braided Hose. This burner will top out at a whoping 220,000 BTUs. 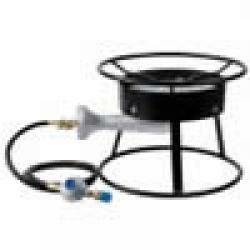 This burner is made for homebrewing. They are 14 inch square across the top for a large stock pot (Designed for 1/2 and 1/4 Barrels) They are 11 inch tall. 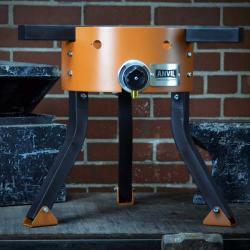 Anvil Brewing Equipment gets everything right with this new burner! 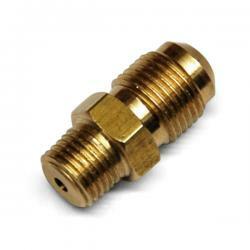 Designed specifically for brewing, this high performance burner can operate at 7 in. and 16 in. heights and has an option for 24 in. leg extensions (sold separately). 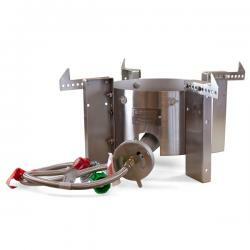 Fast, efficient, quiet and powerful, this burner includes a rust-free precision cast aluminum manifold, ultra-high temperature coating, and patent-pending integral heat shield to keep your components safe! Flame control is easy with the power control knob on the front of the burner. 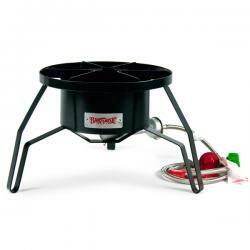 Supporting kettles up to 20 gallons in size, this has all the features that you will need, in a single awesome burner! 45,000 BTU/Hr output for fast heating. Boils 5 gal in approximately 20 minutes! This burner is built to last! 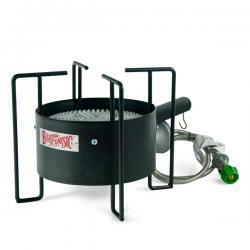 The Banjo burner is a solid iron burner with a hot flame for maximum boiling ability! 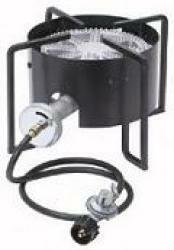 Designed for use with larger pots, the Banjo burner features a manifold that spreads the flame and delivers more power than our High Pressure Bayou classic burner. 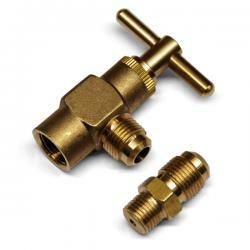 It includes a 0-30 PSI adjustable regulator to control flame and temperature more precisely for applications such as mashing and heating sparge water. 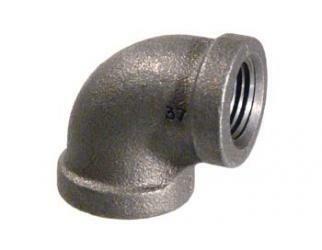 Boils are achieved in a fraction of the time as on gas stoves or inferior burners. Make the switch to a Banjo today and experience the difference! Blichmann Engineering has developed an incredibly efficient (gas sipper), powerful burner that is head and shoulders above the competition! When others burners wouldn't meet the high standards of Blichmann Engineering, they decided to create their own. Blichmann burners are highly efficient, enabling maximum power and energy usage from the 72,000 BTU output, which outperforms inferior burners with higher BTU outputs. This allows for faster heating, getting worts to that coveted rolling boil quickly, and doing it quiet as a whisper. 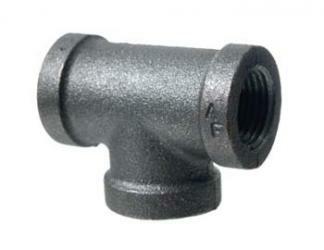 The stainless steel design ensure no fuming, as cheap paints are not used in its construction. In addition, its heavy design makes it quite wind-stable, even under less than ideal wind conditions which would hamper brewing operations on lesser burners. Optional leg extensions allow the burner to be mounted high enough for gravity draining into carboys or other fermentors for ease of use. 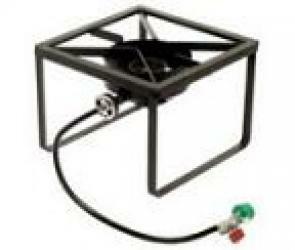 If you prefer to use natural gas, the floor standing burner can easily be converted to use it instead of propane with the optional natural gas conversion kit. 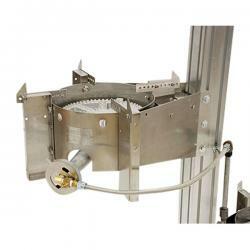 Simply put, Blichmann has gotten everything right with this burner, which will be the last one you ever need! The TopTier stand mounted burner from Blichmann Engineering gives you all the qualities of the floor standing burner, mounted in your ultimate arrangement on the TopTier Modular Brewing Stand! Boasting a high efficiency output of 72,000 BTUs, this burner has been shown to outperform burners with a higher BTU output. Blichmann has ensured this through its highly efficient design that enables more heat to reach the kettle instead of being lost to the atmosphere. The manifold is multifaceted and flames are kept burning a bright blue, ensuring that kettles are not scorched or discolored. 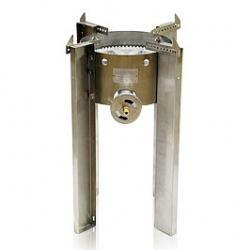 The stainless steel body prevents rusting and fuming that are often problems associated with cheaper burners. 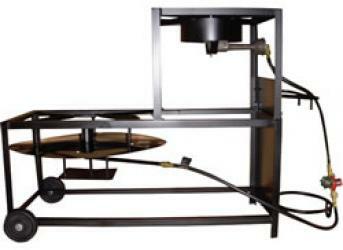 A stable body also ensure optimum performance, even under windy conditions that would be problematic with other burners. 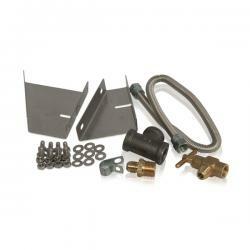 Natural gas conversion is a snap with the optional natural gas conversion kit. These bad boys are built to last a lifetime...no need to buy other burners ever again! 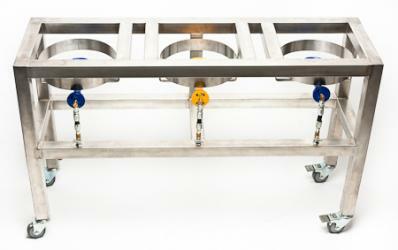 Blichmann products are known to be highly modular, and many can be adjusted to fit the individual needs of brewers. 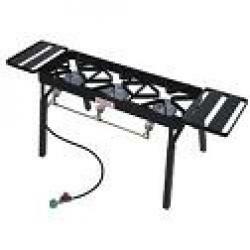 The floor standing burner is no exception! Leg extensions for the floor standing burner raise the height of the burner to 24", which is the perfect height for gravity draining into most standard carboys and fermentors. Brew kettles such as Blichmann Boilermakers that are fitted with a ball valve can be used to drain wort into fermentors at the simple twist of the valve. 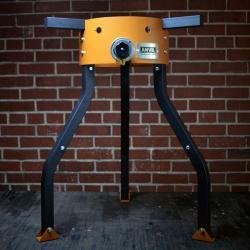 No more unnecessary lifting and siphoning with leg extensions for your floor standing burner! Note: Burner pictured is sold separately. Also do not exceed a weight greater than 150 lbs. when using the leg extensions.